In this exceptional display representing the breadth and dynamism of the artist’s oeuvre, the exhibition imparts a broad understanding of Hogarth’s overarching messages. William Hogarth (1697-1764) stood at the center of a rich tradition of political and social satire in the first half of eighteenth-century England. Inspired by a period of economic turmoil and social unrest, Hogarth’s exquisitely detailed etchings and engravings function as cautionary tales for his fellow Londoners. His multi-layered, visual narratives unravel stories of virtue and vice; they highlight integrity and merit as a means toward tremendous honor and riches, and emphasize corruption as a path leading to dreadful consequences and disgrace. Hogarth’s critique of contemporary society provides a glimpse into the complexities of life in eighteenth-century London – complexities that strangely mirror those in present-day. 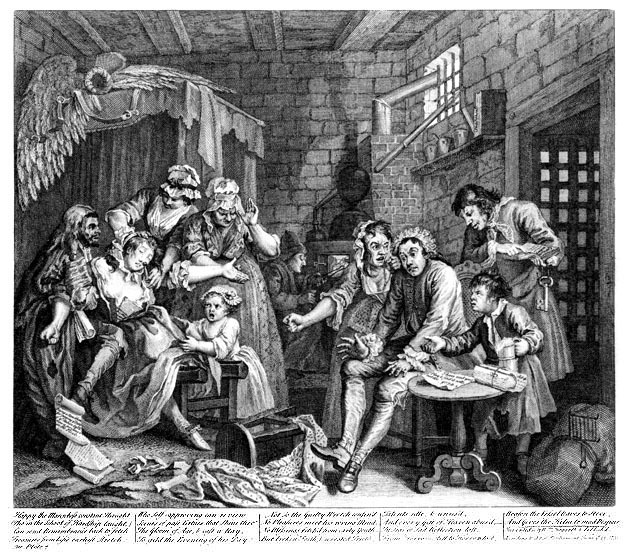 In a fine example of symbolic storytelling, Marriage à la Mode, Hogarth challenges the notion that the wealthy lead virtuous lives. A six-plate progression allows viewers to witness the disintegration of an arranged marriage as a young couple indulges in numerous vices, from gambling and drinking to extramarital affairs. When the husband catches his wife in the midst of an affair, he tries to defend his honor only to die at the hand of his wife’s lover who later hangs for the crime. In the series’ final scene, the widow poisons herself in a fit of grief. Evidence that disease has passed to the next generation is seen in the blemishes of the couple’s young daughter, now an orphan. Hogarth hired French engravers to craft the prints on view in the exhibition, modeled after the artist’s painting series of the same name. Similar accounts of woe are illustrated in Hogarth’s The Four Stages of Cruelty and A Rake’s Progress, also on view.